You wont see very high levels of radiation in human beings because it gets into the human body and stays there for some time. This is why it causes cancer, the radioactive particles replace other elements in the human body and continually release radiation mutating the genes in the cells around the infected tissue. You have the mentality that if we don't see glowing fish washing up on shore it isn't effecting us, couldn't be further from the truth. One microscopic radioactive particle can cause cancer and don't let the federal government tell you otherwise. Especially the radioactive elements release from Fukushima, not only are they radioactive but they are also toxic. All I am saying is we should really consider not eating fish caught in the Pacific Ocean or any other food product from the Pacific. The massive amount of people that are be going to be affected from this will take years to start happening. At that point health care costs are going to be astronomical and it will be a catastrophe. This is the best scenario. If another fuel pool goes, the ocean is going to be in serious trouble. If we don't stop using the worlds ocean as our personal chemical dumping ground there are going to be massive food shortages followed by mass starvation. Last edited by bad apples; 05-30-2014 at 11:44 AM..
Ahhh the technobabble two-step plus more of the same "don't let XYZ tell you any different"
Not to mention I just love their constant doom and gloom predictions "it will be a catastrophe" "it's going to be in serious trouble" "if we don't stop <blah blah blah>" "there is going to be massive <take your pick of major disaster>"
On October 22nd, 2013, the government conspiracy news blog Activist Post published an article attributing various environmental issues on the United States west coast to the Fukushima disaster. On October 29th, the science blog Southern Fried Science published an article debunking many of the points made in the Activist Post piece. On October 28th, the skeptic news blog Skeptoid published an article about Fukushima radiation rumors, referring to the reports as “scaremongering.” On November 28th, the ocean life blog Deep Sea News published an article debunking several radiation rumors which exposed the radiation spread image to be a map of estimated maximum wave heights. On December 24th, 2013, YouTuber Kill0Your0TV uploaded a video featuring a man using a Geiger Counter at Pacifica State Beach near San Francisco, California, claiming that the Fukushima radiation had hit the United States’ coast (URL shown below). In the next two weeks, the video gained more than 560,000 views and 1,000 comments. Last edited by plwhit; 05-30-2014 at 06:13 PM..
You can laugh it up all you want. I have done my research and know it is a problem and is only going to get worse. Go back to eating potato chips and watching football if you don't want to hear the facts that the world governments aren't telling you. The garbage you posted is just an example of how people want to make light of the situation. Some of the stuff was indeed a hoax but a good majority of the evidence now coming out is showing that the fallout from this incident (which is still occurring) will effect the worlds ecosystems dramatically. Only *YOUR* websites post *THE TRUTH* all other websites that us not-in-the-know people read are as you so eloquently put it "post garbage"
You can laugh it up all you want. I have done my research and know it is a problem and is only going to get worse. 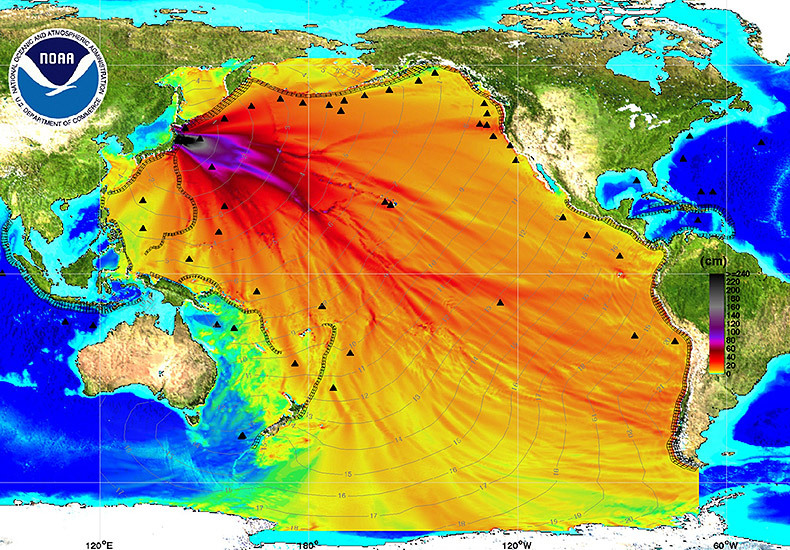 The image you people just love to show everyone, the expansion of the radiation in the Pacific Ocean? However, that chart did not actually track or measure radioactive discharge emanating from Fukushima in 2013, or any other aspect of the Fukushima disaster. It was a plot created by the National Oceanic and Atmospheric Administration (NOAA) immediately after the Tohoku earthquake in March 2011 showing the wave height of the tsunami that followed. It had (and has) nothing to do with the flow or spread of radioactive seepage from Fukushima. Last edited by plwhit; 05-30-2014 at 09:27 PM..
Ok, while I admit I have been on LSD a few times I never mixed it with Kool Aid. That chart would be really awesome with all those colors. However I do think that the issue of Fukushima is sort of hush hush. It may not be as bad as I think it is but it is certainly a lot worse than the government it letting on. That image has been proven to be a fake but that doesn't mean that higher levels of radiation than should be normally considered healthy aren't making there way to the west coast as we speak. It's quite obvious you didn't bother to read the information Snopes researched and published. BTW, this is the Science and Technology forum, not the Conspiracy forum. Last edited by plwhit; 05-31-2014 at 02:04 PM..
That image has been proven to be a fake but that doesn't mean that higher levels of radiation than should be normally considered healthy aren't making there way to the west coast as we speak. Oh I forgot to post one thing. As I posted earlier (just another thing you didn't bother to read) the image is a plot created by the National Oceanographic and Atmospheric Administration (NOAA) showing the projected wave size from the Tsunami that rocked Japan on Friday. The only thing that was fake/a lie was how the plot was labelled and presented to the gullible tree huggers. I am not a tree hugger, quite far from it actually. I just have seen a lot of science proving that it's worse than good old Uncle Sam is letting on.